Freight travels over an extensive network of highways, railroads, waterways, pipelines, and airways. Existing and anticipated increases in the number of freight vehicles, vessels, and other conveyances on both public and private infrastructure are stressing the system as more segments of the network approach or reach capacity, increasing maintenance requirements and affecting performance. Road infrastructure increased 5.2 percent while traffic volume increased 14.0 percent from 2,747 billion to 3,131 billion vehicle-miles traveled, over the 2000 to 2015 period. During that time the total miles of gas pipeline mileage increased 15.9 percent, while Class 1 rail miles declined by 22.4 percent. Intermodal connectors are important components of the freight transportation network (see table 3-2). They provide access between major intermodal facilities, such as ports and truck/ pipeline terminals, and the National Highway System (NHS). Although freight intermodal connectors account for less than 1 percent of total NHS mileage (1,604 miles in 2016), they are vital for truck movement. Texas has the highest number of freight intermodal connectors (104), followed by Ohio (60). 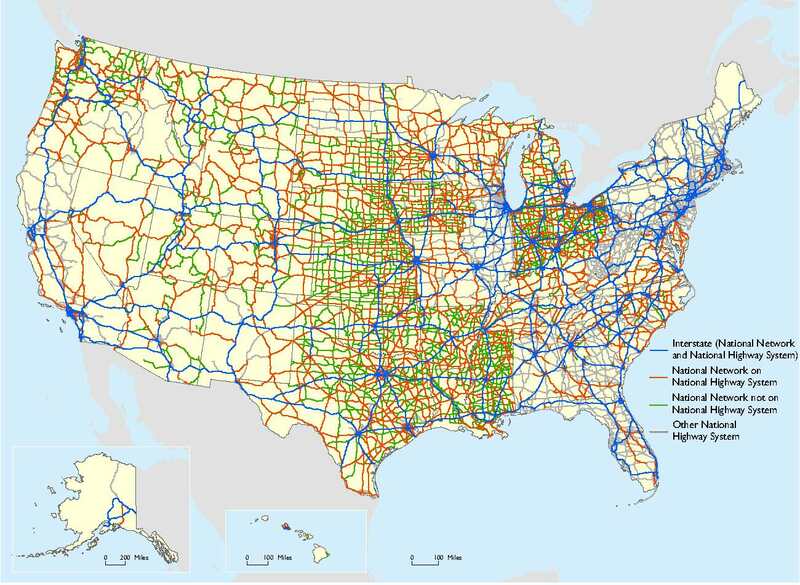 The National Network (NN) was established by Congress in 1982 to facilitate interstate commerce and encourage regional and national economic growth by requiring states to allow conventional combination trucks on the Interstate System and portions of the Federal-aid Primary System of highways. The NN, which has not changed significantly in three decades, differs in extent and purpose from the National Highway System (NHS). Both are about the same length, roughly 200,000 miles, but the NN includes approximately 65,000 miles of highways beyond the NHS, and the NHS includes about 50,000 miles of highways that are not on the NN. The NN supports interstate commerce by regulating the size of trucks, while the NHS supports interstate commerce by focusing federal investments. Longer combination vehicles (LCVs) include truck tractors pulling a long semi-trailer a short trailer (often called a Rocky Mountain Double), a long semi-trailer and a long trailer (often called a Turnpike Double) or a short semi-trailer and two trailers (called a Triple). Although all states allow conventional combinations consisting of a 28-foot semi-trailer and a 28-foot trailer, only 14 states and 6 state turnpike authorities allow LCVs on at least some parts of their road networks. Allowable routes for LCVs have been frozen since 1991. Current demands for truck parking spaces exceed supply, and projected increases in freight volume and a likely increase in the number of trucks may exacerbate the problem. Trucks moved 11.5 billion tons of goods, or 63.8 percent of total freight shipments, in 2015. That figure is projected to climb to 16.5 billion tons by 2045, an estimated 43 percent increase, according to the Freight Analysis Framework. A recent Federal Highway Administration parking survey indicated that most states reported greater shortages of truck parking spaces at public facilities. Public parking facilities are typically located at state rest areas and welcome centers and offer few amenities. Of the 308,920 truck parking spaces available, 88.3 percent were provided by private truck stop operators. The survey noted that 37 states had truck parking shortages at all times throughout the week, and more than 75 percent of truck drivers reported having difficulty finding safe and legal parking during rest periods required by Federal Hours of Service regulations. That number increased to 90 percent at night when drivers often need to wait for their drop-off destination to open and accept deliveries. The shortage of truck parking facilities has major highway safety implications for both truck drivers and other highway users. A vast number of vehicles and vessels move goods over the transportation network. The number of highway vehicles and vessels has remained relatively stable in recent years, while the number of rail cars has continued to decline due to improved utilization and the deployment of larger cars. Pavement smoothness is an important indicator of the condition of roads and bridges. The U.S. Department of Transportation, Federal Highway Administration uses the International Roughness Index to measure the roughness of pavement. Urban area interstates and other freeways and expressways and principal arterials showed modest improvements in pavement smoothness over the 2000 to 2015 period. In rural areas, interstates showed the greatest improvement (13.8 percent) in pavement smoothness, while other principal and minor arterials had increases in road roughness. Highway bridges are a critical part of road infrastructure. Many bridges are located in rural areas, but traffic is heaviest on urban bridges. The overall condition of bridges has improved slowly over time. In 2000, 15.2 percent of urban bridges (89,415) were considered structurally deficient, compared to 9.1 percent (56,007) in 2016. Structurally deficient bridges are characterized by the deteriorated condition of bridge elements and reduced load-bearing capacity. In some cases weight restrictions are placed on structurally deficient bridges, which may impact freight movement. The median age of the Class I Railroad locomotive fleet ranged from 16 to 20 years in 2015, compared to 11 to 15 years in 2010. Class I railroads added 12,327 new locomotives between 2000 and 2015. On average, about 3 percent of all locomotives are new in any given year. The U.S. freight rail system owns and operates more than 138,000 rail miles, including 95,000 miles owned by Class I railroads (defined as having revenues of at least $457.9 million in 2015). To ensure the safety of the system, railroads inspect thousands of miles of track and make needed repairs each year. Of the eight track characteristics monitored, four have decreased since 2010—profile, alignments, warp, and limited speed—while exceptions for gage increased. U.S. flag vessels include a wide range of vessel types that are used to move freight around the globe. However, shallow draft vessels (barges and towboats) make up 93.8 percent of the fleet and operate domestically on intracoastal waterways and river systems. Our inland waterways provide an alternative to truck and rail transportation, a barge can carry an amount equal to or greater than 15 railcars or 60 large semi-truck trailers. Overall, the U.S. fleet decreased by more than 1,272 vessels (3.1 percent) between 2000 and 2014, largely due to the retirement of dry bulk barges. An increase in the percentage of tankers and liquid bulk barges 10 or less years old was largely driven by The Oil Pollution Act (OPA) of 1990, which required double hulls by January 1, 2015. Double hulls provide greater protection to the marine environment from spills caused by collisions or groundings. Locks make it easier for vessels to navigate the uneven water levels of U.S. rivers. Because of increasing traffic and aging locks, vessels may be delayed for hours while locks are shut down for maintenance and repair. The U.S. Army Corps of Engineers reports that the average age of all locks in 2015 was 60 years, with many locks exceeding that average. Between 2000 and 2015, average delay per lockage more than doubled from 64 to 143 minutes. Most airport runway pavements at commercial, reliever, and select general aviation facilities were in good condition between 2000 and 2014, with 17 percent rated as fair. Only 2 percent of airport runway pavements were rated as poor. Gas distribution pipelines comprise the largest components of the U.S. pipeline system. In 2016 gas distribution pipeline mileage totaled nearly 1.29 million miles. Approximately 31.5 percent of U.S. gas distribution pipelines were installed before 1970, and nearly 7 percent were installed prior to 1950. Age and degradation of pipeline material increase the risk of leaks and failures. Most old pipelines are located in the Northeast, while the newest pipelines are found in North Dakota, where recent oil and gas development has spurred the installation of new pipeline infrastructure. Different modes of transportation are frequently used in combination to move cargo. The classic forms of rail intermodal transportation are trailer-on-flatcar and container-on-flatcar, and these services are spread throughout the United States. The largest concentrations are on routes between Pacific Coast ports and Chicago, southern California and Texas, and Chicago and New York. Long-haul freight truck traffic on the National Highway System is projected to increase dramatically. Projected data indicate that truck travel may increase from 282 million miles per day in 2012 to 488 million miles per day by 2045. Several routes carry a significant concentration of trucks, either as an absolute number or as a percentage of the traffic stream. Nearly 5,560 miles of the 222,743 miles of the National Highway System carry more than 8,500 trucks per day where at least every fourth vehicle is a truck. The number of National Highway System miles carrying large volumes and high percentages of trucks is projected to increase dramatically by 2045. Segments with more than 8,500 trucks per day and where at least every fourth vehicle is a truck are estimated to grow from 5,560 miles in 2012 to 13,480 in 2045, an increase of more than 140 percent. Freight goods depend heavily on the Interstate System for delivery. Although only one-fourth of the miles traveled by all traffic is on the Interstate System, about one-half of combination-truck vehicle miles of travel are on interstate highways. Despite doubling over the past two decades, truck traffic remains a relatively small share of highway traffic as a whole. In 2015 commercial trucks accounted for approximately 9 percent of highway vehicle-miles traveled. Truck tractors hauling semitrailers and other truck combinations accounted for approximately 60.8 percent of commercial truck travel, while single-unit trucks with six or more tires accounted for the remainder. Federal and state governments are concerned about truck weight because of the damage that heavy trucks can do to roads and bridges. To monitor truck weight, more than 208.3 million trucks were weighed in 2015, about 68.9 percent of which were weigh-in-motion, and 31.1 percent were weighed by static scales. Less than 0.2 percent of commercial vehicle weighs resulted in violations. The top three U.S. airports together handled more than one-third of the total landed weight of all-cargo operations; they are Memphis, Anchorage, and Louisville. Memphis and Louisville are major hubs for FedEx and the United Parcel Service, respectively, and Anchorage is a major international gateway for trade with Asia. Both Memphis and Louisville experienced an increase of more than 50 percent between 2000 and 2015. Although the top ports for containerized cargo are primarily on the Pacific and Atlantic Coasts, bulk cargo, such as coal, crude petroleum, and grain, moves through ports on the Gulf Coast and inland waterway system. The top 25 water ports by tonnage handled 69.1 percent of the weight of all domestic and foreign goods moved by water in 2015. Containerized cargo has grown rapidly from 17.9 million TEUs in 2000 to 32.0 million TEUs in 2015, and is concentrated at a few large water ports. The Ports of Los Angeles and Long Beach together handled 32.4 percent of all container traffic at water ports in the United States. Container trade at these two ports increased by nearly 61 percent between 2000 and 2015, but was outpaced by the growth in container trade for the entire United States, which grew by 79 percent. In 2015, 7,836 oceangoing vessels made 82,044 calls at U.S. ports, a 36.8 percent increase since 2005. Tankers accounted for 40.4 percent of total calls, followed by containerships (22.8 percent) and dry bulk vessels (16.7 percent). The average vessel capacity per call at U.S. ports has increased 2.1 percent, from 49,834 deadweight tons (dwt) in 2005 to 50,877 dwt in 2015. The greatest capacity increase from 2005 to 2015 was observed in container and dry bulk. The average size of containerships increased by 28.8 percent in terms of dwt as carriers expanded the deployment of megaships in U.S. trade.